With almost three decades of experience, our doctor offers advanced surgical treatments to put your mind and mouth at ease. At Advanced Dental Health, we provide extractions, bone grafting, and implant placement. We will begin with a thorough consultation to determine whether you are a candidate for oral surgery at his Phoenix, AZ, practice. Then will plan a custom procedure accordingly, tailoring it to meet your health needs and personal preferences. With a full range of restorative treatments, we always attempt to save your compromised teeth. However, if you have severe damage, extraction may become necessary. We also perform wisdom teeth extractions, and he can treat impacted teeth and other difficult cases. Wisdom tooth extraction is very common, but we will never recommend removal unless it is necessary. With almost 30 years of experience in oral surgery, the doctor studies the most advanced techniques in this field to provide the best possible treatment. Tooth extraction procedures can vary. In many cases, the doctor may simply need to loosen the tooth slightly before removing it. However, if you have an impacted tooth, he will first need to remove the gum or bone tissue covering it. Advanced Dental Health uses gentle techniques and effective local anesthesia, so you should feel nothing more than a sense of pressure during treatment. Whether you have undergone dental extraction, or you have lost teeth in some other way, you may benefit from dental implants. Dental implants will replace your tooth roots and uphold a custom-crafted restoration. After taking CT scans of your jaw, the doctor will insert the small titanium posts in your bone. He will choose the exact placement of the posts to ensure a strong foundation for your restoration. As your jawbone heals, the implants will integrate with the surrounding tissue, and over time they will become permanently fixed in your mouth. To qualify for implants, you must have enough bone tissue to support the posts. Bone recession is a common consequence of tooth loss. Fortunately, if you have suffered jaw recession, you may still qualify for implants. 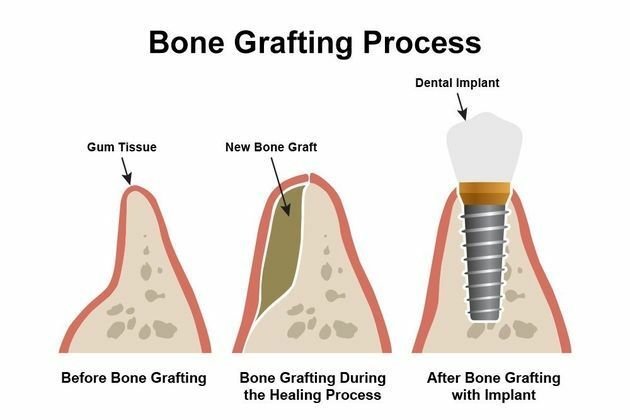 Advanced Dental Health offers bone grafting to rebuild your jaw and support the titanium posts. During this surgery, he will place a sample of your own bone (often taken from your hard palate) or a substitute material over the recessed areas of your jaw. The sample will fuse with your jawbone over time. You may need a bone graft to bolster your jaws before receiving implants. Why Choose Us For Your Oral Surgery? At Advanced Dental Health, providing patients with state-of-the-art dental solutions is our mission, and we strive for the best possible results in each and every case. The doctor has helped many patients achieve a better quality of life with implant-supported dentures. If you are suffering with missing teeth, and wish to achieve a fully restored smile, contact our office today and schedule a consultation. Advanced Dental Health offers gentle care that involves minimal discomfort and recovery time. To learn more about our oral surgery expertise, contact Advanced Dental Health today.